I like the Magnetic Fields. I've liked them for a good long while. I wasn't "there" when they hit the scene or anything, but I am no neophyte. Strange Powers is not really a documentary for me. While it delved into Stephin Merritt's past, revealing things I myself would probably have never known had I not seen the movie, I didn't really feel the need any more depth to his story. I enjoyed his rather anonymous presence in my world. The movie also chronicles tMF's rise to less-obscurity, which I was sort of there for, so I didn't really need that either. 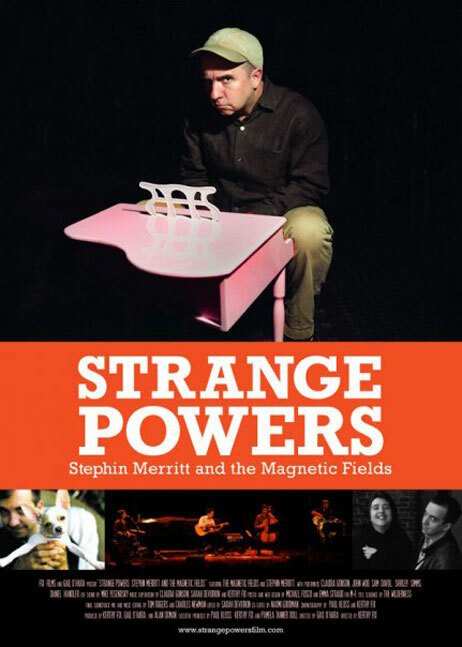 Strange Powers is a documentary for people who haven't heard of the Magnetic Fields. The only real problem is that I don't think people who don't know about Stephin Merritt are really going to be interested in seeing this doc. Not that it's a bad documentary, but that, unless you already know about tMF, it just may not jump out at you. And I don't think Stephin's story is so engaging that I would be able to recommend watching it unfold. So, if you're a tMF fan, or would like to be, maybe check it out. Otherwise, I think you can do without seeing it.